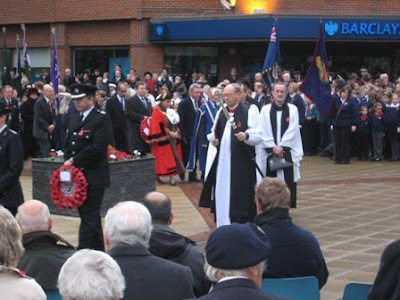 Last Sunday I had the priviledge to attend the Remembrance Day memorial service and parade in my home town of Woking. The service was conducted in the open air in the town square in front of the war memorial for the fallen of the First World War. There was an amazing turnout with attendance from all branches of the military, the police, the fire service and local civic dignatries as well as the public. I was particularly impressed that there were many young people there to show their respects and wearing their poppies with pride. I suppose that the death of our soldiers in Afghanistan keeps reminding people of the futility of war. At 11 am there was a minutes silence for reflection followed by the playing of the last post on a solitary bugle. I found the whole experience very moving. 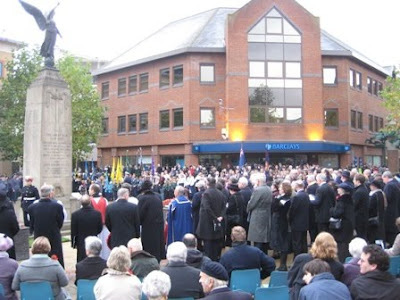 The impressively attended Remembrance Day service in Woking Town Square in front of the First World War Memorial. The Lady Mayor in full regalia arrives for the service. 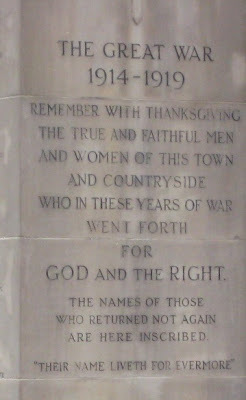 The poignant inscription on the War Memorial in Woking town square. The various wreaths of poppies laid at the foot of the memorial. 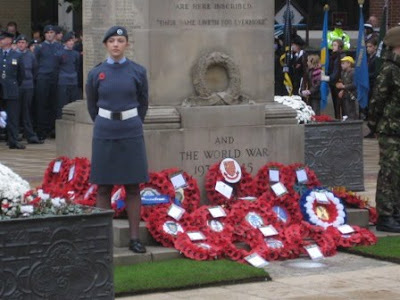 My son Josh in air cadet uniform is in the background immediately to the left of the memorial.